Baking is a large part of my home cooking, so I was excited to review Cinnamon Square: A Measured Approach, Precision Baking by Paul Barker, from the award-winning bakery in Rickmansworth. It’s a fantastic manual for baking. 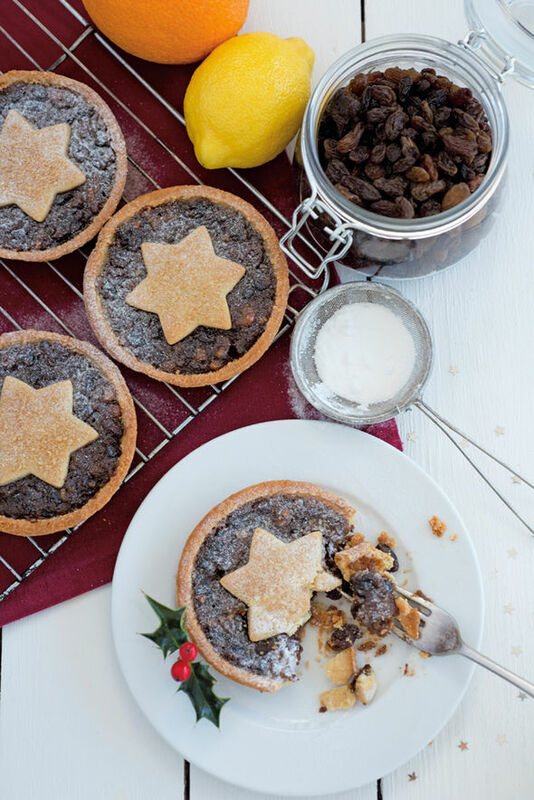 Enjoy the Christmas pudding and mince pies. Pre-soak the dried fruits in hot water and drain thoroughly. Place them in a large plastic bowl with the remaining ingredients from stage 1 and mix together. In a separate bowl, place all the ingredients from stage 2 and mix together until thoroughly blended through. Add the powdered ingredients to the fruit mixture and thoroughly combine together. Finally add the vegetable suet and gently mix through (be careful not to damage the suet). Prepare pots or basins by coating the inside with a light layer of butter. The amount added will vary on the size of your containers but you should aim to fill them to around three quarters full. Place 120g into individual pots and 400g into a 4 portion size pot. Cover the pots with their lids or foil. Place them into a roasting pan with some water three quarters up the sides of the pots. Cover the whole roasting pan with foil to keep the steam inside while baking. Place the roasting pan into your oven and bake at 140°C/275°F/Gas Mark 1. Time will vary depending on the side of your pot, but as a guide the 120g pots will take 3 hours and the 400g pots will take 6 hours. To make the rich sweet pastry, place both flours, sugar and almonds in a plastic bowl and mix them together until thoroughly dispersed. Add the butter and blend with the powders until a smooth paste is formed. Although this will look like a workable paste at this point, it will be crumbly as it still requires the egg to bind it together. Add the egg and gently blend this through. Stop mixing as soon as it comes together. Leave the paste for 20 minutes to firm up a little before use. If it is still too soft to use, then place it in the refrigerator for 20 minutes. Bring it back out and gently knead the paste a little to even out the temperature. Leave it for 5 minutes to firm up. Line six 10cm diameter tart cases. Dock the base with a fork to help release any trapped steam during baking. Gas Mark 4 for 10-12 minutes (until the top edge just starts to show signs of turning golden). If the bottom of your sweet pastry puffs up during baking, press it down with tissue. Do this about 10 minutes into the bake as the pastry will be flexible. Using more of the pastry, roll out some as above and cut out some star shapes. Carefully place the stars on a baking tray, then place in the oven and part bake at 180°C/350°F/Gas Mark 4 for 8-10 minutes. To make the mincemeat filling, place all the ingredients (except for butter and suet) in a large plastic bowl and stir together until mixed. Gently melt the butter in the microwave or over a pan of hot water and then stir through the fruit mixture. Finally, add the suet to the mixture and gently fold through until evenly dispersed. Be careful not to damage the suet pieces as you fold them through the mixture. Place 85g of the mincemeat filling into the part-baked pastry case and flatten them level. Place a partly based pastry star on top of the filling. Spray a little water over the top of the pastry and sprinkle with demerara sugar. Place the filled pastry cases onto a baking tray, then bake at 180°C/350°F/Gas Mark 4 for 12-15 minutes.